The Zambian government has declared the Cuban Ambassador to the country personae non grata. On Saturday, Cuban Ambassador to Zambia, Nelson Pages Vilas, openly supported the newly launched opposition Socialist Party in Zambia. In what he described as revolutionary greetings, the Ambassador said his government was wishing the Socialist Party in Zambia all the best. But Zambian President Edgar Lungu said the Cuban Ambassador has breached diplomatic ethics, practice and standards by his action. According to the president’s spokesman Amos Chanda, the ambassador cannot speak and offer open support to any political formation, he can’t do that even to the ruling party. The government asked Cuba to recall its ambassador “for behavior unbecoming of a diplomat, Chanda told a media briefing on Sunday. 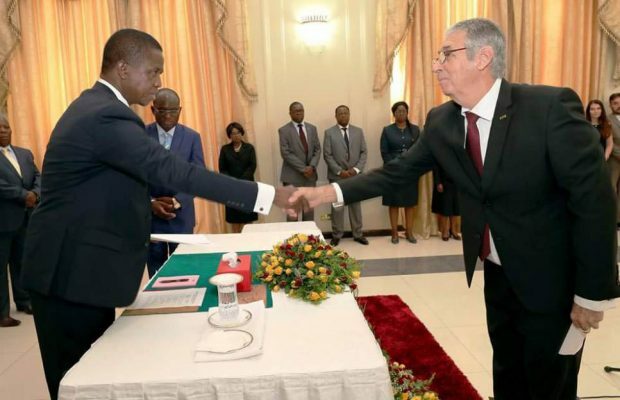 The Cuban Ambassador to Zambia Nelson Pages Vilas has just presented his credentials in Zambia last week. In receiving the credentials, President Lungu said Zambia and Cuba had enjoyed a long-term friendship and continue to share warm relations based on common values, mutual respect and interest. According to Amos Chanda, relations between Zambia and Cuba will continue to remain strong and intact despite Government’s handing over of the Note Verbale to the Cuban diplomat and Government. Posted by Steven Addamah on April 3, 2018. Filed under News. You can follow any responses to this entry through the RSS 2.0. Both comments and pings are currently closed.